Medical-grade refrigerators and freezers are used across clinical applications in acute and non-acute healthcare environments. These specialized cold storage units include special features to ensure proper performance for storage of sensitive, expensive, and sometimes irreplaceable blood therapies, medications/vaccines, reagents, and patient samples. Blood Banks and Hospital Pharmacies routinely adopt medical-grade refrigerators and freezers exclusively in place of lower quality commercial and consumer-type units. In addition, medical-grade cold storage adoption across the entire hospital laboratory is a continuing trend according to feedback from US-based Lab Directors and Administrators in a recent survey. Medical Lab Management released their 5th Annual State of Laboratory Technology National Survey in November, 2018. This report included a survey of 377 US Laboratory Directors and Administrators to better understand trends related to technology acquisition and utilization. This survey reinforces adoption trends of medical-grade cold storage with 36% of respondents reporting exclusive use of medical-grade refrigerators and freezers across their lab. 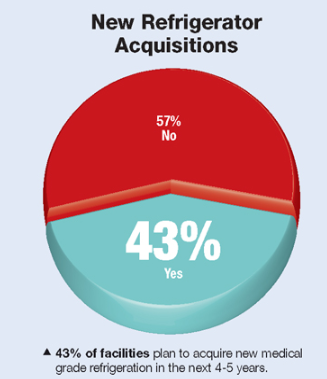 In addition, over 40% of respondents have new medical-grade cold storage in acquisition plans. Helmer Scientific continues to be a leader in medical-grade cold storage; 50% of respondents sited Helmer equipment in use in their lab making Helmer one of the most common brands used for laboratory cold storage. See the complete survey from Medical Lab Management.